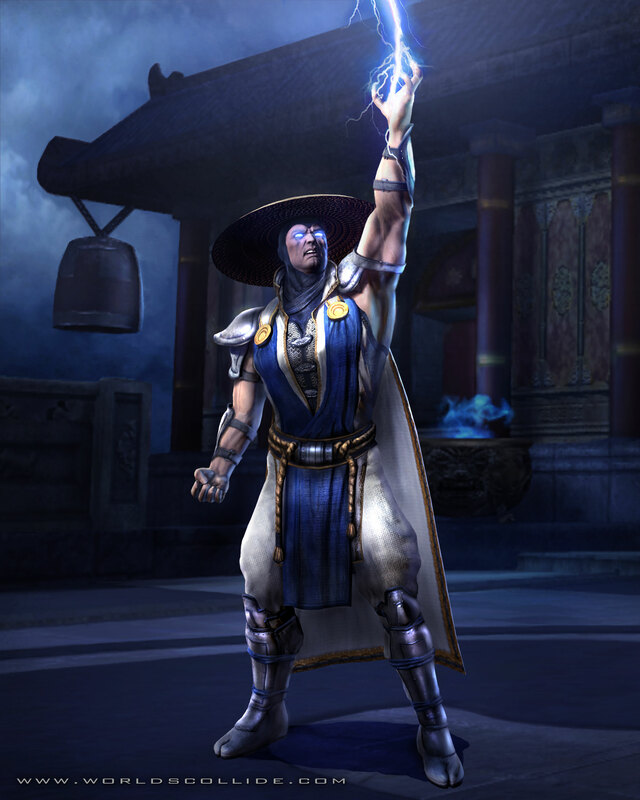 Midway has released a new high-resolution render of Raiden from the upcoming Mortal Kombat vs. DC Universe. Thanks ter83. Updated with higher resolution image from WorldsCollide.com. That is the most badass Raiden ever. He's gonna lay the smack down on Sups. 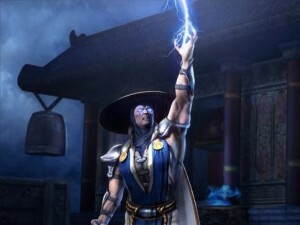 I'm glad he's light Raiden (although that was suspected since Liu Kang is covered in flesh this time around). I can only hope the lightning effect is as kickass in-game. The stupid lightning projectiles they've had in MK2-A were just bad. Worse in MK4-A but even in MK1/2 lightning just doesn't look like that. I hope he has a real BOLT this time rather than a dinky slow-moving shock orb. I love that hat. Yeah, you know he looks very dark in this pic without the red eyes. He became Dark Raiden in MKD/MKA because of the storyline. Hopefully at some point he'll be brought back to good and not corrupted by darkness like he currently is. This render is awesome, easily one of the best Raiden looks ever! He looks badass. I wouldve preferred Dark Raiden to mix up the storyline, but this works fine. dang, is raiden on roids? Nahh, just for once showing off his arms. I think some people are shocked since a God has muscles but I think it's very appropriate given his title. Earth to Midway/Team MK, still waiting on the full render. wuhoo! blew that one up! woot woot! Took them long enough. Does anybody know why they changed his name from Rayden to Raiden? Technically Raiden should be pronounced Righ-Den as in High or Tie. Rayden is the proper spelling for the way they pronounce it. See Raiden from MGS4. Pronounced Righ - den. Where our Raiden is pronounced Ray - den. I was gonna mention him, dunno why I didn't. But that is the right example. Raiden from MGS is pronounced correctly. Our Raiden is not. Ah, good to know. I never played MK in arcades much mostly because I was 10 or so when they started to become unpopular and I wasn't really allowed to go to arcades before that. So I always thought his name was Rayden first. Whatever the reason they're still spelling it wrong for the way they say it. As for reading the various MK character's wikis, I don't see the need. I've seen all their bios/endings and read about them in manuals, official strategy guides, the works. In the rare occasion there's something I don't know about the character, like the name thing, it's probably just a mild curiosity that can be clarified quickly. i wonder if kidd thunder will ever return? thanks, that was a very entertaining read. i have always suspected that big trouble in little china had influences on mk. Everything is inspired by something, but MK's not exactly like BTLC. Such as super powers, Gods etc lol and of course "Fatalities" hehe Other games after SF and MK were actually inspired by both of them such as DOA, KI, Tao Feng and many others. DOA and Taa the creators of both (one being Tobias) admitted they were inspired by MK, DOA creator I still have the GI issue somewhere in an old interview was inspired by MK and SF believe it or not. As for the other comment on last page by I think Glamador, MK was never "unpopular" but on a bit of a hiatus once MK4 disappointed and then disappeared for 5 years before MK:DA came out. Some people thought that "was the end for MK" but Midway proved lots of people wrong hehe ; ) The thing and one of the key reasons why I'm proud of Midway/MK is that they're one of the few American companies still kicking and I believe the ONLY fighter that's actually 100% american. Most are japanese.